I found a small book of poems entitled Venice Poems - 1965 by British poet Peter Russell (1921 – 2003) in storage at my local library. This poem about Campo Santo Stefano set me researching the history of this campo, which though large, has always seemed to me to be cosy and cheerful with its wide spaces and outdoor cafes (including Paolin and its famous pistachio ice-creams). 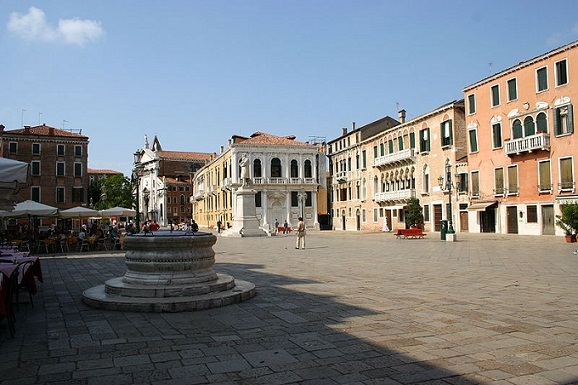 The campo is named after the Gothic church of Campo Santo Stefano, notable for its wooden’s ship’s keel roof. Apparently, bull fights used to take place in the campo, and these were stopped in 1802 after part of a stand collapsed. The campo is also known as Campo Francesco Morosini. Morosini (1619 – 1694), was Doge from 1688-1694, during the Great Turkish War. Morosini is infamous for having all but destroyed the Parthenon during the siege of Athen in 1687, and looting some of the surviving sculptures. A marble arch in his honour was placed in the Doge’s Palace after his death and his beloved cat was embalmed and placed in the Museo Correr.